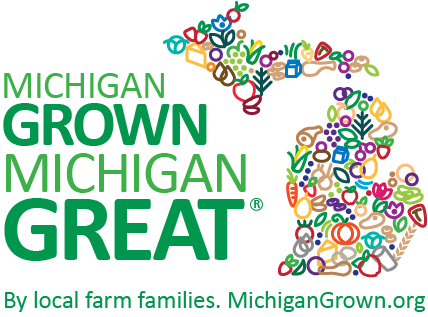 Warmth and views of cows on the horizon | MICHIGAN GROWN. MICHIGAN GREAT. My motivation to get out of bed and trek outdoors in bad weather is knowing that I am responsible for living animals. They depend on me to provide food they require to survive and create heat. I also just enjoy seeing our cattle every day. Something about seeing cattle eating soothes my soul. Feeding the cattle is easy and enjoyable because we are blessed to have cabs with heat on all of our feeding tractors. The most difficult job in the winter months is trying to keep water in liquid form. Most times it’s not a huge issue, but when temperatures stay below zero for extended periods of time, ice is inevitable. At sub-zero temperatures, I’ve seen the ice on top of the water tanks get up to 6 inches thick. 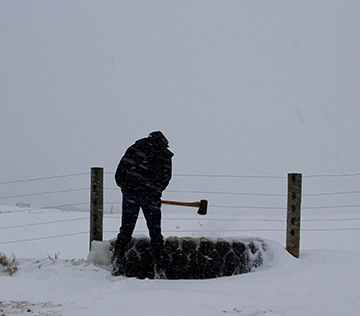 We have to chop a hole through that ice with an axe, so the cattle can reach the water, and make sure the float (that keeps the water flowing up to a certain level in the tank) is free and not frozen in the ice as well. Since cattle require water every day, this is as important as making sure they are fed. 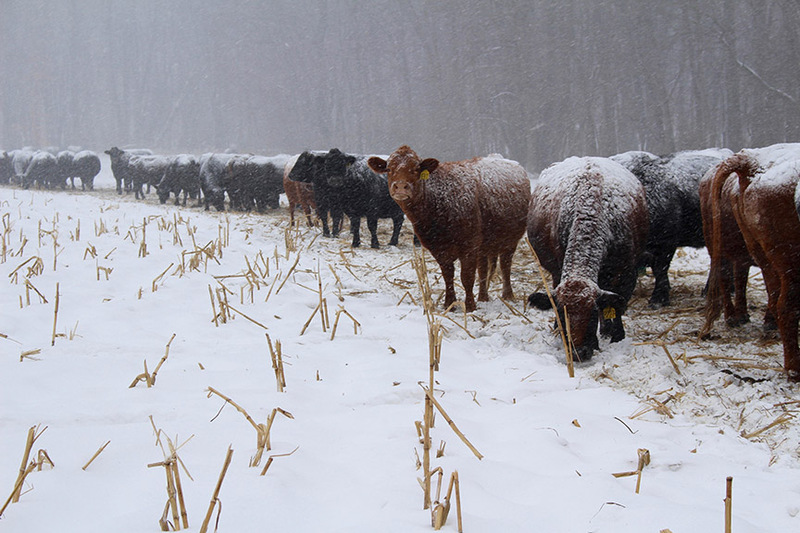 All of our cattle are outside year-round with very few exceptions. One reason for this is that it would be very expensive to build enough barn space for all of them. Also, beef cattle are hearty animals that can withstand Michigan winters. All they need is a little wind protection so wind chills don’t affect them and enough food. Cattle have four stomach compartments, one of which is the rumen. The rumen fills with roughage and acts like a furnace generating a lot of heat inside the cow when she eats. Also, their skin is very thick, and in combination with their fluffy hair coat, this provides very good insulation. Sometimes they will have a lot of snow on their backs that isn’t melting, showing how well the skin and hair coat is at insulating from the elements. Their internal body temperature is around 102°F. I usually wear between two and three layers of clothes when I venture outside on bitter winter mornings. To me, my insulated coveralls are the most essential to staying warm. But just like cattle, I need to eat to maintain strength and create warmth. I may be a little biased, but most of my meals are centered around beef. 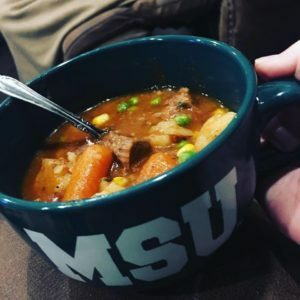 Anything from beef stew to beef roasts, or even my favorite meal of steak and potatoes. Karl Wernette is a third-generation beef cattle and crop farmer in central Michigan who has been involved in farming since he could walk. 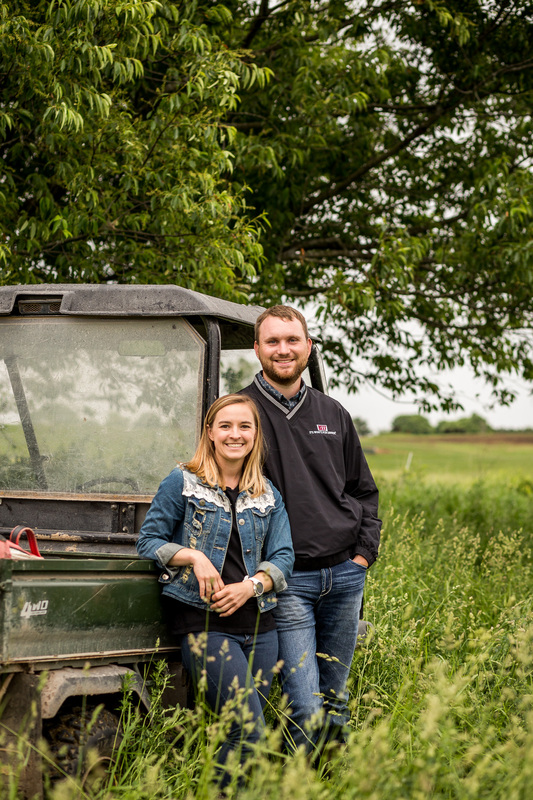 He pursued a bachelor’s degree in crop and soil science from Michigan State University and is now actively involved in all aspects of the farm with his dad. Together they care for the cattle and the land to the best of their abilities, with a focus on sustainability and environmental stewardship. Wintery photos by Katie Sollman, who is an agriscience educator in southwest Michigan and also a graduate of Michigan State University. She enjoys spending her weekends at the farm taking pictures of the cattle and cooking meals featuring Wernette Beef.